If there’s a more accurate description of how most marketers operate, I haven’t seen it. 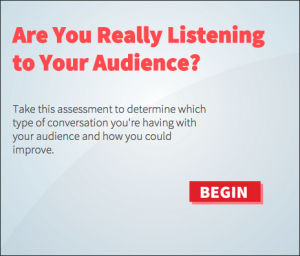 Listening is critical to success in this new era of informed consumers and ROI-focused revenue marketers, where every purchase is carefully considered. Buyers are more discerning than ever; they’re looking for hyper-relevant content that responds to their exact needs and stage in the buying cycle. How can marketers hope to answer that imperative if we’re not listening to understand what our buyers are doing, thinking, and saying? 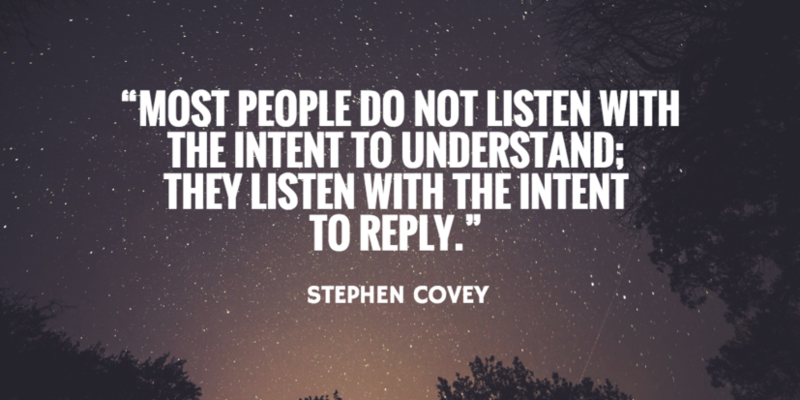 One of the best arguments in favor of listening is that it allows marketers to find out what problems their prospects really think are important. Marketers must listen, and listen carefully, to determine if they’re solving the problem they think needs solving or the one their audience actually needs solved. Because that’s how we sell – we sell to the value of solving a problem and resolving a pain for our prospects. It’s marketing’s job to uncover that value and lead a prospect down the right path – while arming sales with key information about what your prospects want. Every digital interaction contains a rich set of data that are part of the message (just like the body language and social cues of face-to-face conversations) that can help marketers find out if their content is resonating for their audience. Existing marketing technologies allow marketers to replicate in digital interactions the active listening that takes place in person. What are prospects doing? Are they clicking our emails, viewing certain web pages, spending time on other pages? Where do they bounce out of our content? In this category, marketers use metrics like clicks, views, time spent on site, and behavior flow (captured through tools like Google Analytics, Marketo, Eloqua, and others) to find correlations and connections between what prospects are doing and how we could better answer their questions and solve their problems. What are prospects thinking? Is our content resonating with them and guiding them through the buyer’s journey? Are they signing up for our email newsletter or sharing our content on social? Marketers can turn to email tracking (Yesware, ToutApp, HubSpot Sidekick, SalesLoft, and others), marketing automation systems, social analytics tools (Twitter, Facebook, TweetStats, Unified) and A/B testing software like Optimizely to identify exactly what’s resonating and change out what’s not. What are our prospects saying? What words do they use, and are they the same words we use in our marketing? What problems do they want solved, and are we solving them through our content? This area is an explosive growth category when it comes to marketing technologies – there are blog comment moderating systems like WordPress and Disqus; social media monitoring tools like Radian6 and Meltwater; pulse-takers like Google Alerts; and interactive content platforms like SnapApp (disclosure: my company), ion interactive, PollDaddy, SurveyMonkey, and others. These technologies facilitate real connection with buyers and allow marketers to ask straight questions and get a straight answer. Based on these three categories, marketers can now use technology to collect better insights on the front end and create structured data on the back end to influence strategy and make better decisions. To get the most out of a shift toward listening, marketers must make this data collection programmatic. The first step here is to set your goals and start small. What metrics correlate with buyers and sales alignment and move the needle for your sales process? If you want to make your content resonate for your audience, A/B test subject lines or newsletter content and make incremental changes based on the results. As marketers, we only have a few chances to say the right thing. Our prospects have so many reasons not to pay attention – we need to listen to their needs, speak their language, and give them reasons to say yes. Seth Lieberman is the founder and CEO of SnapApp, a content marketing platform that gives marketers the power to generate leads and drive revenue by creating, publishing, promoting and measuring interactive content that works across the web, email, mobile and social. Seth is a serial entrepreneur who has started three companies and four kids. Two of his companies have been acquired but none of his kids.